224 pages | 1 B/W Illus. The China Development Research Foundation is one of the leading economic and social think tanks in China, where many of the theoretical underpinnings and policy details of economic reform were formulated. 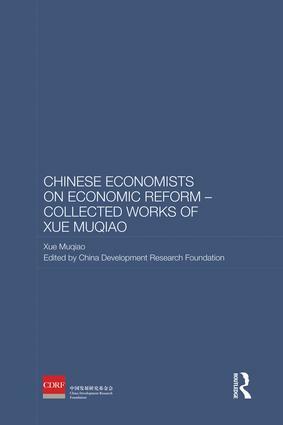 This book is the first of a series which makes available to an English-speaking audience the work of the individual Chinese economists who were the architects of reform. The series provides an inside view of China’s economic reform, revealing the thinking of the reformers themselves, unlike many other books on China’s economic reform which are written by outside observers. Xue Muqiao held many key posts including Secretary General of the Finance and Economy Commission of the Government Administrative Council, Director-General of the National Bureau of Statistics and consultant of State Council Office for Restructuring the Economic Systems. His work included eliminating the serious inflation of the early years of the People’s Republic, participating in drafting and implementing the First and Second Five-year Plans, and establishing the initial statistics system and price management system. His great contribution was to the development of economic theories and practice following China’s economic reform. China Development Research Foundation is one the leading economic think tanks in China, providing a base where many leading Chinese economists have developed the details of Chinese economic reform. Xue Manqiao’s major publications include China’s Socialist Economy, Preliminary Opinions on Economic Restructuring and Several Theoretical Issues on Socialist Economy.